Hi there — after staying quiet for a few days, I’m back with lots to tell you. Yesterday we visited two Swiss factories. 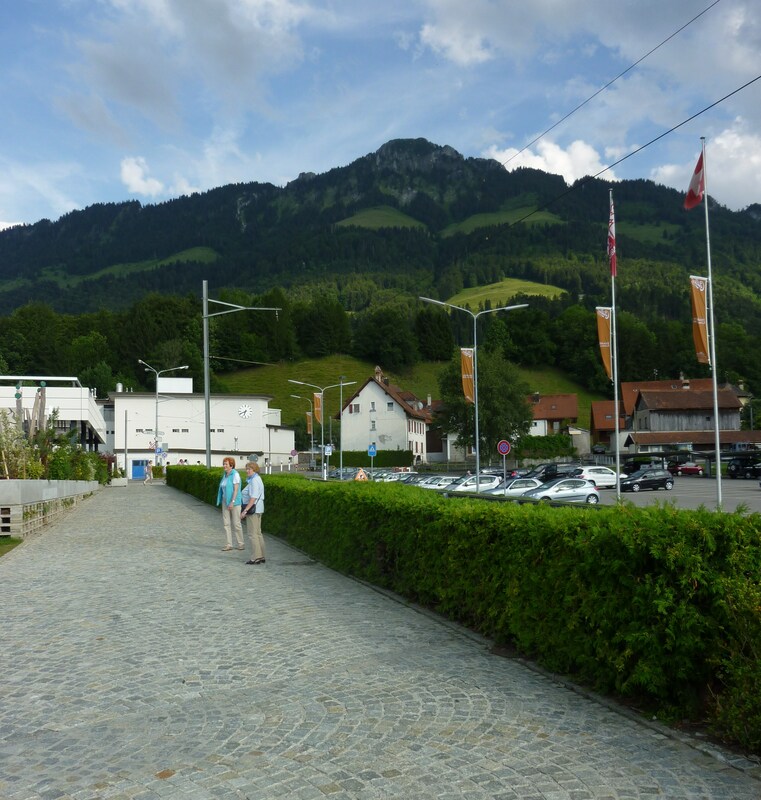 It was a thoroughly enjoyable day, but also a pretty long one, since these factories were located in or near Gruyères, which is a 2.5 hour trip from Zürich (by train-bus-train). 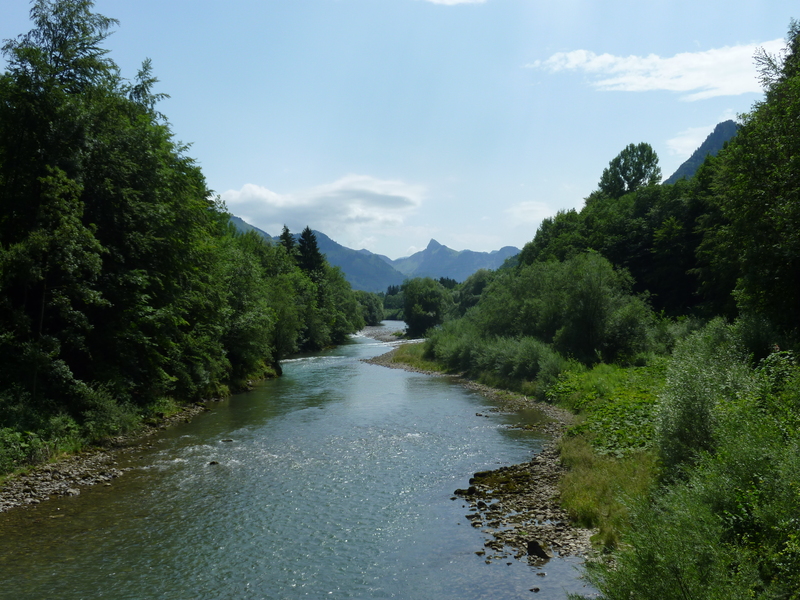 Our group decided to visit Gruyères (in the French part of Switzerland) because we wanted to hike, and there are nice trails (or wanderwegs, as the Swiss call them) here. We also went there because thunderstorms were forecasted, and I don’t think I’ve mentioned it yet, but Switzerland knows how to throw a heck of a thunderstorm. Last week, for example, we had thunder, lightning and driving rain for about four hours continuously — I never knew this to be possible, since the Toronto boomers I grew up with were typically over in less than an hour, and Vancouver rarely had thunderstorms. 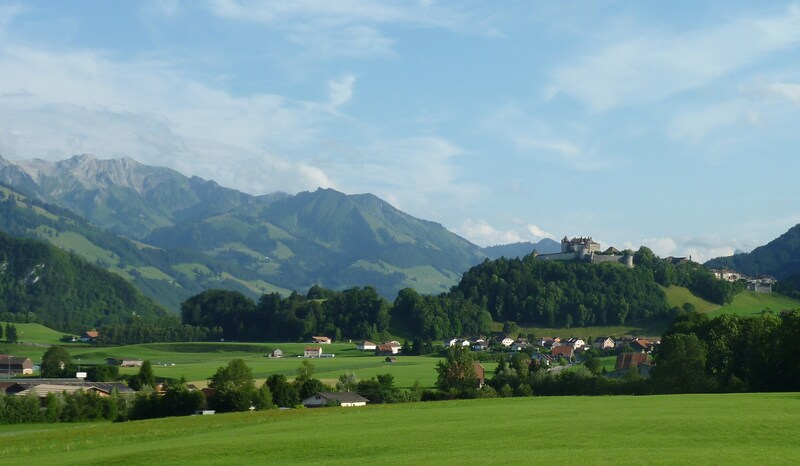 Anyway, Gruyères was a good option because if the weather forecast was borne out, we could visit the factories instead of being lightning poles on the wanderweg. And indeed, it was already raining by the time we arrived, so we ducked into the Gruyère cheese factory, which had a restaurant where we ate a cheese-filled lunch while sitting by the restaurant’s one all-glass wall and watching a typically fierce storm play out. After lunch, we toured the factory. In retrospect, I might have reversed the order of the activities — the factory would have been an excellent way to whet one’s appetite, but having just eaten my fill of cheese, I was not as enthralled by it as I might have been. Each visitor receives a sample pack containing three pieces of Gruyère cheese aged 6, 8 and 10 months, but sadly I had no appetite for it at the time. 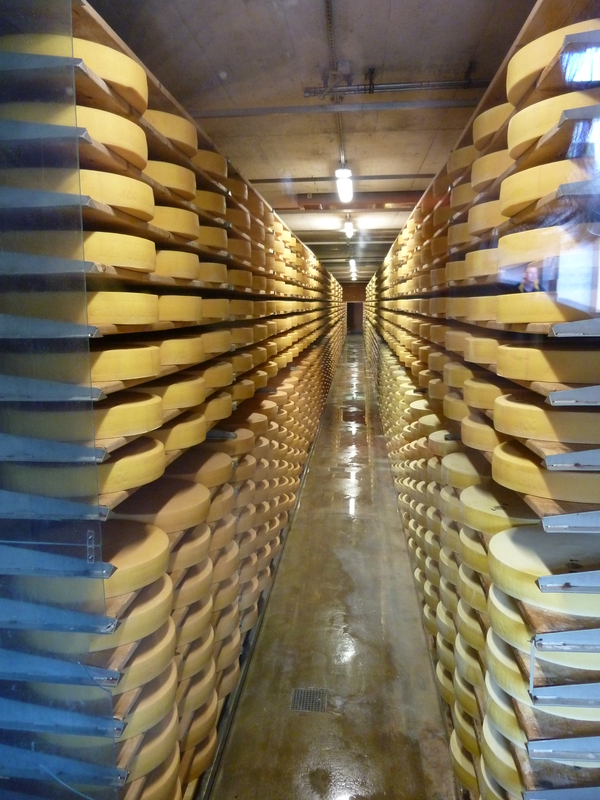 The factory — or at least, the part on display from above — basically consists of one room, in which a giant vat of cheese-coloured liquid was stirred continuously without any appreciable change during the time that we watched. 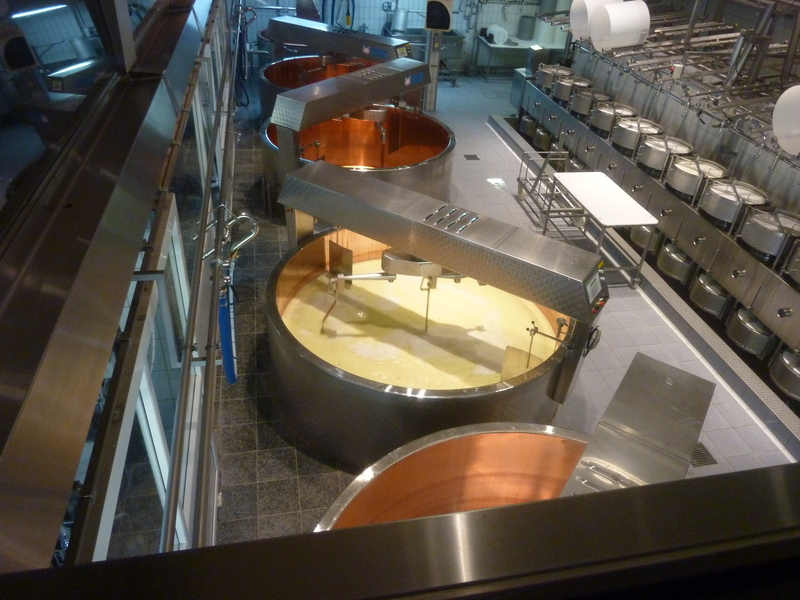 And to the right of the vat are some drums containing cheese that is undergoing some kind of draining/hardening process…the floor below them was collecting the run-off. Mmm — Rivella, anyone? The more impressive part of the factory, in my opinion, was the cellar, which consisted of several rows like this one. One member of our group had a Rick Steves guidebook, which advised us that a highlight of this factory tour was seeing a robot moving up and down the rows, “lovingly flipping and rubbing the cheese.” Well, naturally this phrasing conjured up all kinds of fantastic notions in our heads (mine, at least) so that when we did see this robot doing its thing, we (I?) were struck by its disappointing lack of anthropomorphic qualities. It is an impressive system, for sure, but I think Rick Steves’ ghostwriter (surely he doesn’t actually author all his books?) suffered from a wee attack of hyperbole when writing that particular description. …we arrived at Maison Cailler, in the lovely little town of Broc. 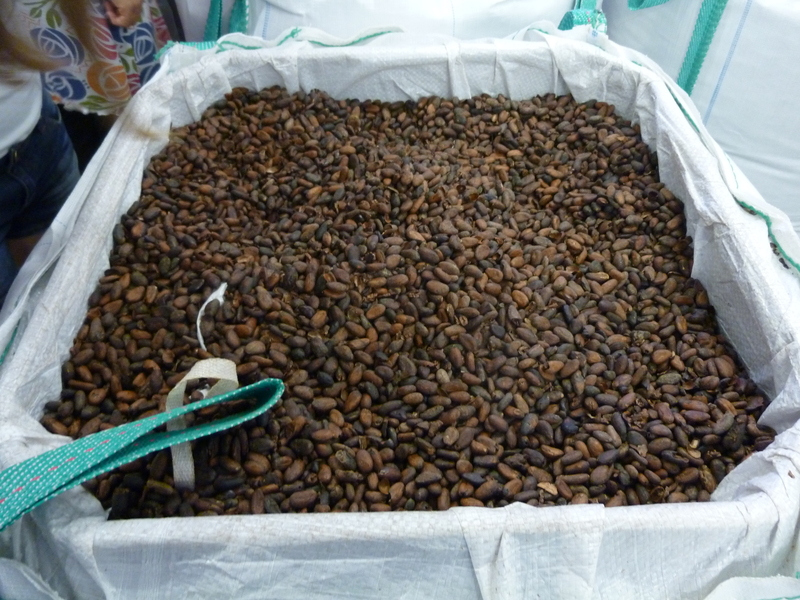 Isn't it just how a chocolate factory should look? By the time we arrived at the factory, we were sweaty and had rediscovered our appetites. It was shortly after four, and though the factory was supposed to be open until six, we were advised that there were already too many groups in queue; they were very sorry, but they could not admit us. Luckily, two other Canadians in our group (one of whom hails from Montreal) were able to use their French to wheedle the chocolate factory agent into a concession: “fine, but you are the last group we are letting in.” Whew! We were happy and grateful, and not even bothered by the fact that we’d have to wait an hour and a half before our tour (tip: it’s probably best not to come here on a partially rainy Sunday!). The wait was well worth it. 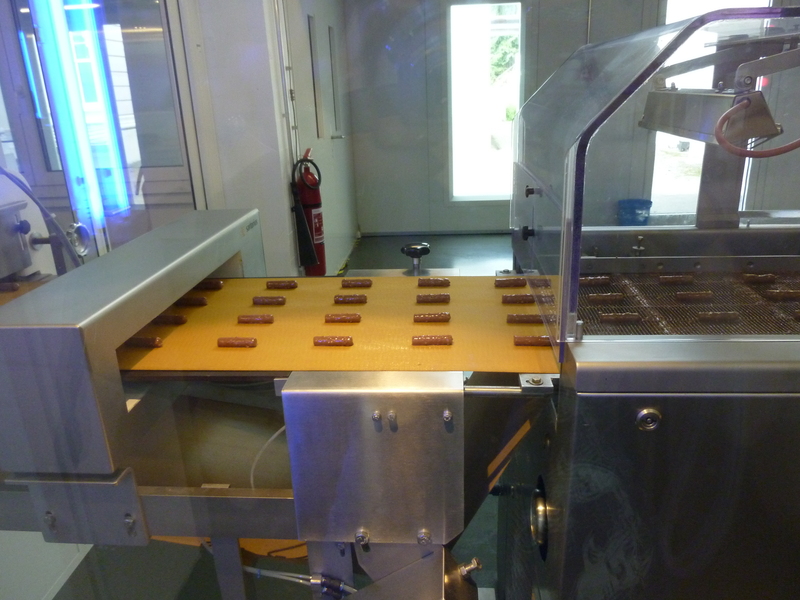 This factory’s entrance fee was 10CHF, and the value for money was pretty incredible. 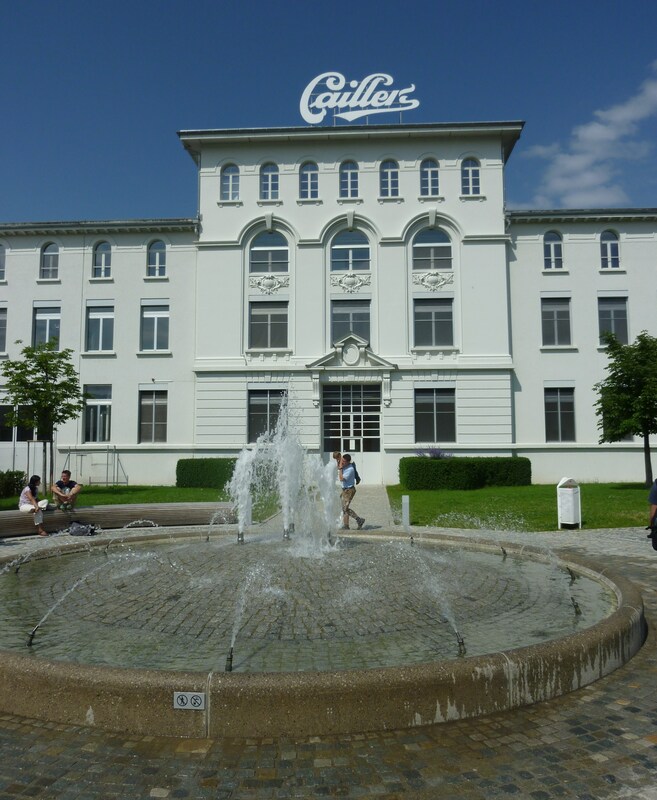 The first part of the tour consisted of a 20-minute walk through different rooms that, using audio recordings and impressive moving visual displays, educated us about the history of chocolate in general and the Cailler brand in particular (Fact: Cailler is owned by Nestle, that giant Swiss conglomerate also familiar to you North Americans). I haven’t been to Disneyland, but I’m confident in my assessment that this is the type of production that you find there. I think it would help if I could stick my head in one of these whenever I feel sad. 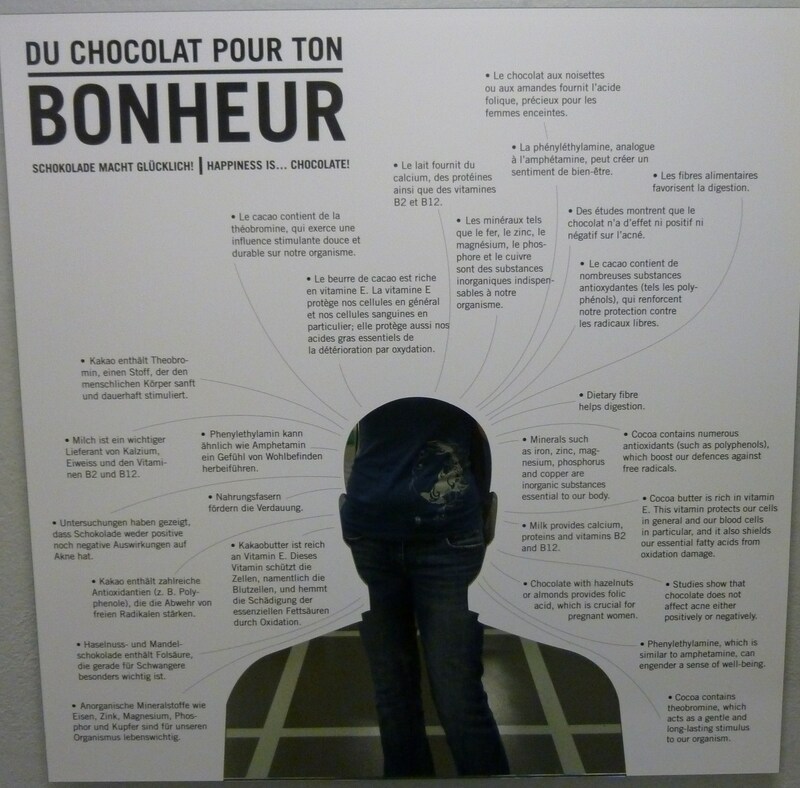 Many posters like this one gave reasons that one should eat chocolate. However, I wonder about their inclusion of the mirror (in which you can see my legs reflected). Is this a subtle way of reminding people to limit themselves? 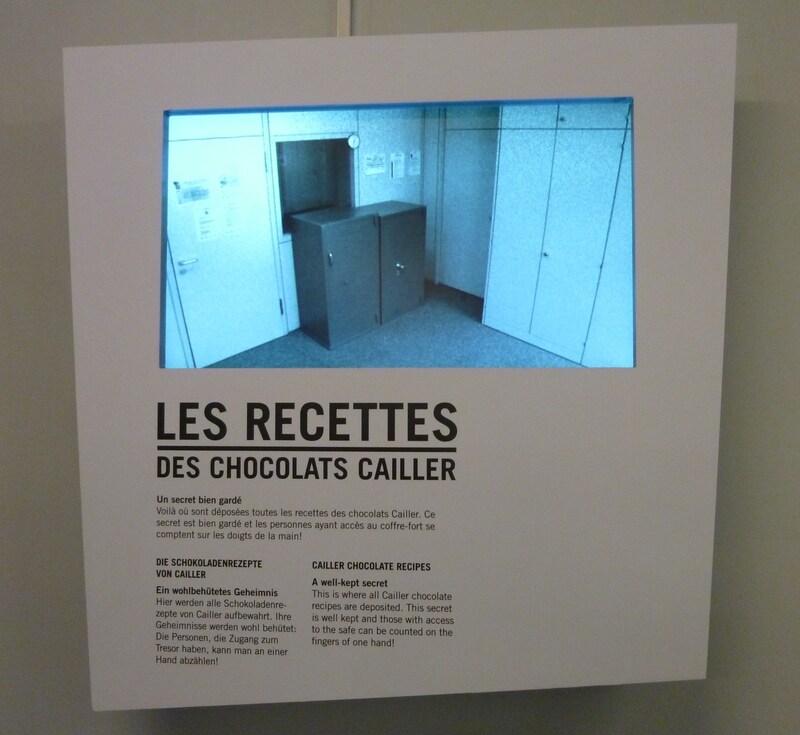 I cannot express how much I love this -- video surveillance of the room where the "secret recipes" are kept. Finally, we passed by part of an automated assembly line — Stelian was impressed by its robotic components, including an arm that picked up the pieces at lightning speed. We got to sample the finished product of this line, and I thought, well, that was a pretty complete tour. We passed through a hall where you could leave comments (and where other people’s were tacked on the wall) which was, for me, a definite indicator that it was over. I was happy and satisfied. But then we walked into the room. It was a large room containing trays of every kind of chocolate that Cailler makes, and you could stay as long as you want and eat as much as you wanted — the only rule was that you couldn’t leave the room with chocolate in hand. I’m sorry that I was too awestruck to take any pictures of this. I ate a few samples and then forced myself to leave, but some of our friends stayed for a while longer and certainly got their money’s worth. This is why I’m falling more and more in love with the French part of Switzerland: they have a wonderful sense of humour (clearly, they wanted you to think the tour was over before the hitting you with the grand finale. Oh, and there was a fat mirror outside the factory exit :)), they offer such delicious food, and their scenery is all yeah, and I don’t even have to try to look this good. In addition to all this, I’ve come out of this weekend with my eye on a new dream job. 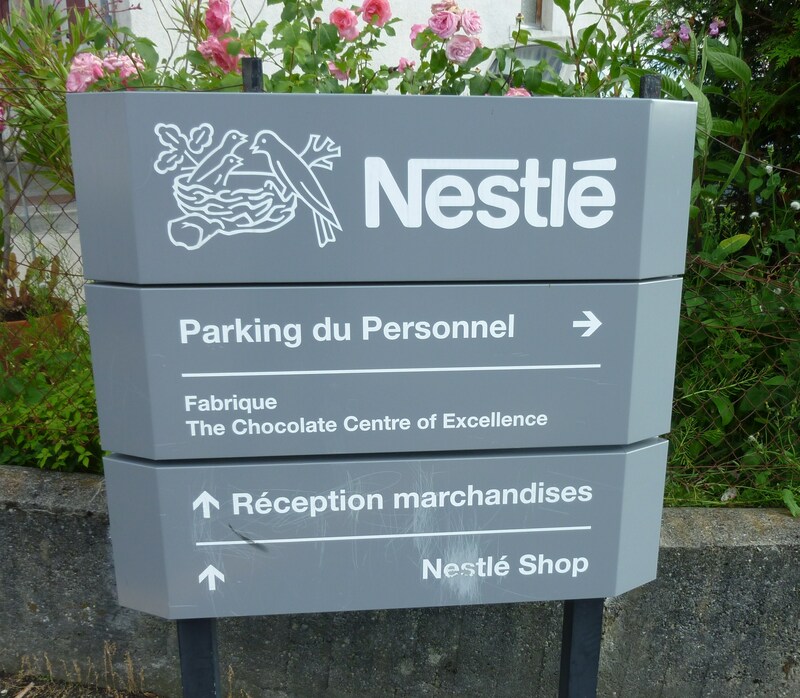 Come on — who wouldn’t want to work at the Chocolate Center of Excellence? French Switzerland, once again, je t’aime.